8 September 1157, Beaumont Palace, Oxford. Eleanor of Aquitaine (1122 - 1204). 12 May 1191, Chapel of St. George, Limasol, Cyprus. 2 September 1189, Westminster Abbey. Massacre of Jews, March 1190. Richard I leaves for Crusade, 4 July 1190. John opposes William Longchamps, Administrator of England, 1191. Richard I's fleet separated at Cyprus, April 1191. Richard I attacks Acre, 6 June 1191. Acre falls to Richard I, July 1191. 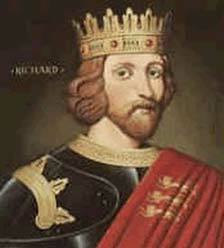 Richard I shipwrecked, December 1192,. Richard I captured by Emperor Heinrich VI, February 1193. Richard I returns to England, Marhc 1194. Siege of Chalus, Marhc 1199.